Last week our team of Sook, Dave, Lori, Marc, Phillip, Byron, Sam, and I tried once again to win the 2005 Herald Hunt. We solved the five main puzzles but the final puzzle stumped us and we didn't win that cruise to DR (that's Dominican Rupublic for those not from south Florida). Someone snapped a picture of us trying o-so-stealthily to peek at the crayon picture since we were too lazy to color it in. The best puzzle was the "Handout Puzzle". Read about it, look at the pics, and see if you can figure it out. In order to see the answer, highlight the answer with your mouse to reverse the text. In the herald hunt, the answer is always a number. This year was the first year I ever carved a pumpkin. 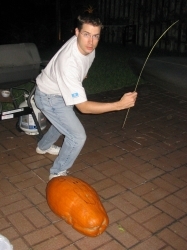 Since we had no power after Wilma, we decided to go to the pumpkin patch, pick out a nice gourd, and carve it. Don was very protective of his gourd. Sook, Don, Jill, you have been studying hard for the national boards! Good luck next month! I'll be in OKC (that's Oklahoma City for those that have never left south Florida) soon to see my whole family, including Candee's newborn, Lauren. Yesterday we celebrated B and Spencer's engagement. You two will do great! Arnie and Ali are getting married next year in Hawaii; I can't imagine you two apart. Arnie, sorry Alabama lost yesterday, their schedule is just too rough. The marathon training is going well. January 7th is race day. Those that are running: Sook, Don, Jilma, Nitin & Carolina (Nitolina), Steve-O, and HC. In addition, the college gang is driving/flying down to O-town: Holly, Ali M., and Debbie. Ali S. may be able to make it and Dan should be coming but won't be able to run. Less than 2 months away! Thanks for the "good luck!" I surely need it. I love the new format of your website. So did you enjoy carving your first pumpkin? Have a wonderful trip to OKC! !